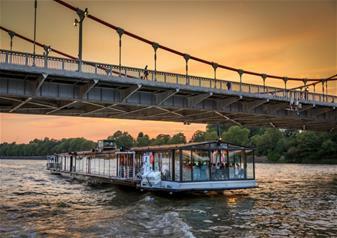 The Thames river afternoon tea cruises offered by Bateaux London are a great way to escape from the hustle and bustle of London life. Thames river afternoon tea cruises are ideal for both business meetings or those wishing to relax with friends and family. Relax and enjoy the spectacular views as the Thames afternoon tea cruise takes you past some of London's magnificent attractions: London Eye, Tate Modern, Shakespeare's Globe, Tower of London and Tower Bridge. The Resident Pianist will create a soothing and calming atmosphere by playing some of the well known classics. Treat your friends, family or loved one to London's sights whilst enjoying the delicious afternoon tea and music from the Resident Pianist. Bateaux London reserves the right to refuse entry based on inappropriate attire. Refunds will not be offered under such circumstances. Child Policy: Children under the age of 3 are not permitted onboard. Prams, bassinets or pushchairs are not permitted on the vessels.